Judas and St. Peter both failed Jesus. While St. Peter’s failure was not as egregious, he still denied Christ to avoid suffering. It was through his repentance that Jesus forgave Him. That wasn’t necessarily an easy thing for Jesus to do. We know that Jesus is fully man, and such forgiveness would be hard for us. Remember, He was deeply troubled and in agony with his impending passion, and in His passion He suffered greatly, both physically and emotionally. St. Peter added to Jesus’ wounds by denying Him. But Jesus forgave Him still. Despite how disappointed and righteously angry Jesus would have been, He forgave St. Peter as soon as he asked for it. Can you imitate Christ and His willingness to forgive? As we journey with Christ towards His passion, contemplate the pain he underwent emotionally. Think about how terrible it hurt to have those closest to Him turn against Him. 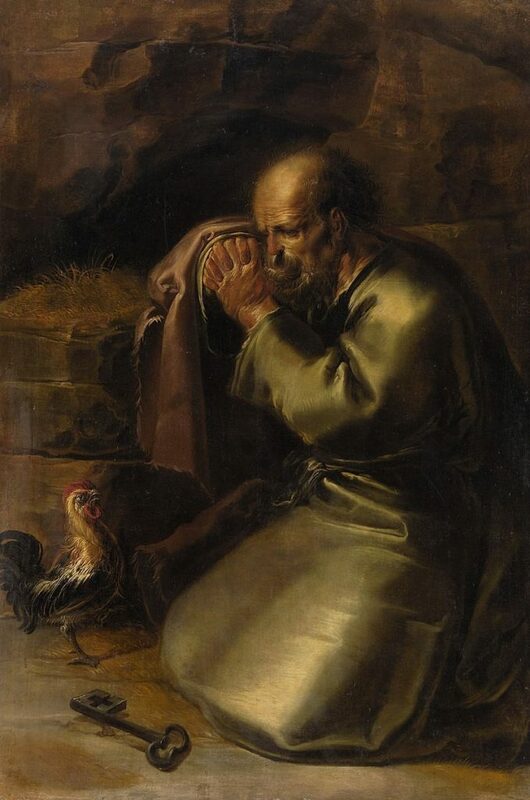 Pray about how difficult it would have been for Him to forgive St. Peter. Is there anyone in your life that you need to forgive? Has anyone betrayed you? Is there something you can do to be more Christ-like in this relationship?